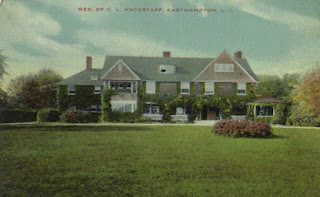 The Mrs. Charles L. Hackstaff residence designed by J. Greenleaf Thorp c. 1899 in East Hampton. Click HERE to see the Hackstaff residence on bing. Mrs. Hackstaff was Margaret Euphemia Hoffman, the daughter of Eugene Augustus Hoffman and Mary Crooke Elmendorf.